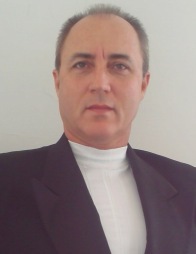 Below is the Official History of the Dominion of Melchizedek (from 1998 – 2012) as told by the two longest standing members of the DoM: Prime Minister – David Williams and Dr. Dewey Painter – Minister of Humanitarian Aid and Education during the first Emergency Session of the Body-Politic since the institution of the New DoM Charter. This meeting took place in Florida on February 21, 2015. 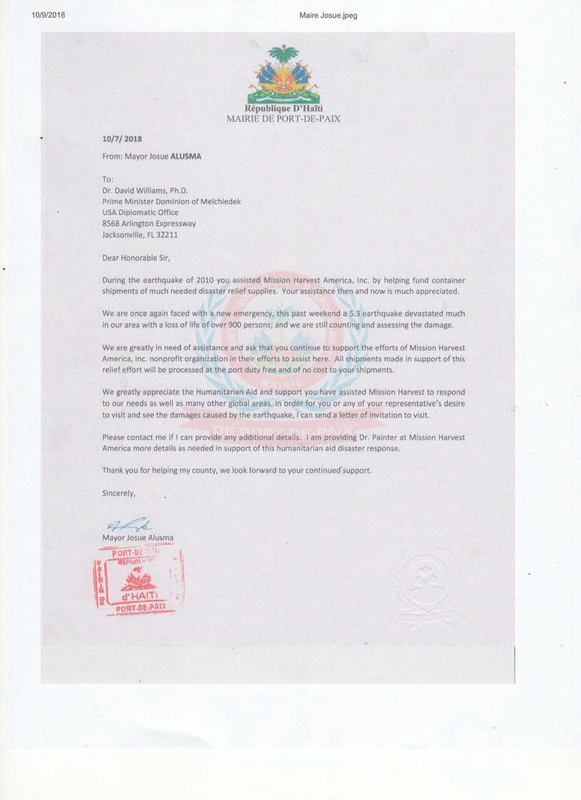 The Dominion of Melchizedek received a letter of recognition dated February 18, 2015, from the Republic of Liberia for cooperation and humanitarian assistance during the outbreak of Ebola. The Ministry of Health & Social Services was grateful for the container of medical supplies funded and provided by the Dominion of Melchizedek in association with Our Minister of Humanitarian Aid and Mission Harvest America. 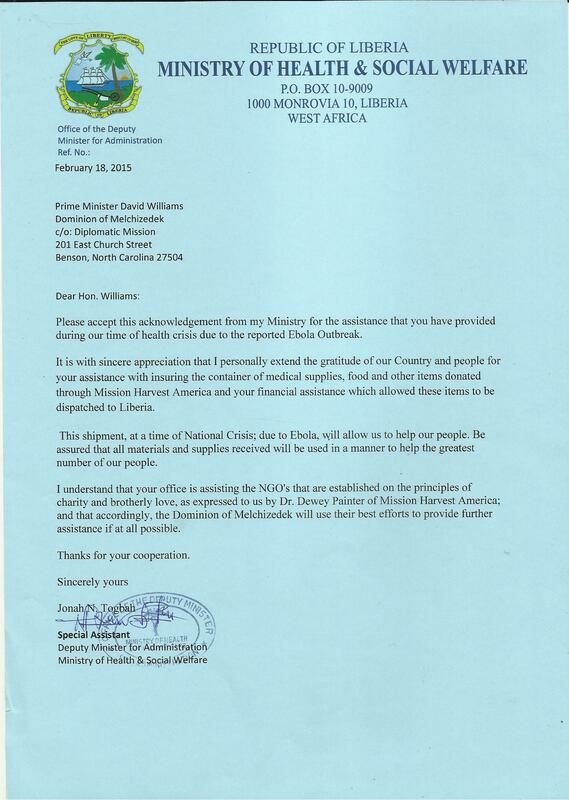 The People of the Dominion of Melchizedek was honored to assist a fellow Member of the Great Family of Nations during their time of Health Crisis with the recent Ebola Outbreak and will continue our efforts to assist all Nations and Their people through Humanitarian efforts. THE CURRENT STANDING SOVEREIGN MEMBERS OF THE DOMINION OF MELCHIZEDEK DENOUNCE THE “MELCHIZEDEK BIBLE” AND HEREBY EMPHATICALLY DECLARE IT HAS NO BEARING TO THE FUNCTIONS OF ADMINISTRATION OR PHILOSOPHY OF THE CURRENT STANDING SOVEREIGN MEMBERS OF THE DOMINION OF MELCHIZEDEK. THE “LAW OF NATIONS” IS THE GUIDING PRINCIPLES FOR THE DOMINION OF MELCHIZEDEK. This is a Notice to the International community establishing on record that “Tzemach Ben David Netzer Korem” is no longer affiliated with the Dominion of Melchizedek in any form or what so ever including the Official Website “melchizedek.com” by his own words. 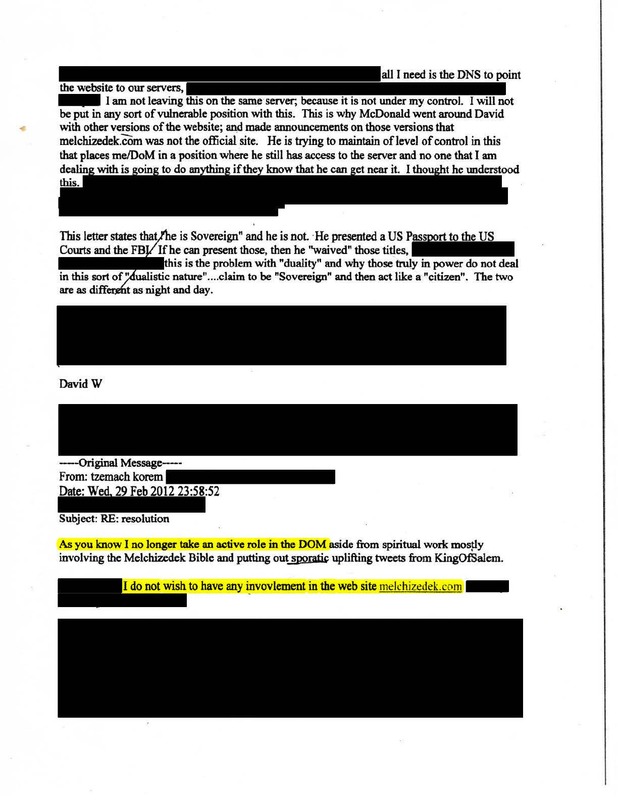 Below you will find an image of the email communication between the now sitting Prime Minister and Head-of-State David Williams and “Tzemach Ben David Netzer Korem”.